Are You Sick Of Competing With Everyone And their Mothers For The Same Slice Of The Affiliate Marketing Pie? Affiliate marketing is rough. Its competitive and stressful and can make you want to pull your hair out when things go wrong. The beauty of affiliate marketing, though, is that when things go right, it can be the best thing that has ever happened to you in your entire life. Its no wonder then that affiliate marketing is the most popular way to make money online. When so much money is at stake, everyone is trying to dip their hands into the honey pot. The result is, and I am sure youve noticed this already, that for every ClickBank product you find to sell, the market is already flooded with affiliates. With so many people trying to sell the same thing, the market just is not the cash cow that you were led to believe it is. There is a solution though. There is a way to make a great deal of money with affiliate marketing and the best part is that you will never have to deal with ClickBank ever again. You can sell real world products online, the type of products that you and everyone you know routinely buy everyday. Items like shampoo, books, magazines, electronics and even the weekly grocery trip can all be sold with an affiliate commission. Wouldnt You Love To Sell Products That People Are Already Searching For? When I started working online, I was determined to make big bucks fast. I had a neighbor who was making big bucks doing affiliate marketing and every chance he had, he made sure to let me know how great he was doing. It drove me up the wall. Every time I saw him he would tell me how he made $10,000 for three weeks of work or how he just made enough that morning to take his family to some exotic vacation spot. He was the worst kind of bragger, the type who always knows how to rub it in everyones face. I heard his boasts for months and I secretly wished his business would suddenly fall apart. I knew a little bit about how Internet businesses worked and I knew that their success rate was pretty low. I was struck with jealousy and developed an overwhelming disdain for my annoying neighbor. As time went on and his business didnt go down the toilet, I knew I needed to do something else to shut him up. His boastings were growing louder and more frequent. I knew that making money online was not the hardest thing to do, I thought that if I was able to make money online too, it would shut his yapper. So, that afternoon I sat down in front of my computer and tried to make sense of the pieces of affiliate marketing I knew. I surprised myself a little bit when I realized how much information I picked up from the neighbor. As he was bragging, he would explain how he did what he did to make money. My subconscious clearly was listening even if I was trying not to. So I started doing the whole ClickBank affiliate thing and assumed Id be rolling in the dough soon enough. To my shock, nothing I did worked. I didnt make any sales, didnt produce any leads, didnt even capture a single email address. Everything I did failed. I was not looking to give up though. I kept my fingers to the keyboard and tried again. But again, nothing worked right. I was determined to succeed, so I kept working. I changed niches, changed strategies and even tried changing my entire approach. The result was the same though. Every morning my PayPal account informed me that I had the same amount of money in it as the previous day. It was depressing. If it was not for my annoying neighbor, I would have given up at this point, but every time I saw him, he had a smug smile on his face and a glow in his eyes that said I am more successful than you. I needed to knock him off his high horse. With my motivation firmly in place, I refused to give up. I kept trying everything I could think of to make even the smallest amount of money. I was working so much that I had little time to go food shopping, and soon my fridge was empty of any kind of quickly edible food. I briefly considered taking an hour out to go to the store, but didnt want to leave my work unfinished. I then remembered that one of the supermarkets by my house was advertising a new online delivery service. I quickly surfed over to their site and ordered whatever food my house was lacking. Right after I paid, I noticed a banner ad on their site that was advertising an affiliate program. I was curious, so I clicked it. My eyes widened as I saw that affiliate marketing was not just for downloadable eBooks, but that there was a market for real world affiliate products as well. I started searching around for other real world websites with affiliate programs and eventually stumbled upon a couple of websites that acted as hubs for most real world affiliate programs. All I had to do was sign up to one of these affiliate sites and I was able to act as an affiliate for any product I could possibly think of. I started building websites, creating campaigns and focusing all my attention on selling products that people are already interested in and are looking to buy. I started making money and once it started pouring in, it wouldnt stop. I was making more money than I really ever thought possible. As people are starting to buy more and more of their day to day items online, a huge opportunity is being created to make fistfuls of cash. This is like the early days of affiliate marketing where making money was easy. You can learn how to make money by selling real world products too, with Real World Affiliate Profits. Dont Get Frustrated By Your Inability To Make Money With ClickBank, there is Hope For You Yet! You will learn how to find the products that are right for your customers and how you can get them to buy from you again and again. Remember, you will be selling products that they were looking to buy anyway, so if they buy from you once, the chances are much higher that next time they are shopping online, theyll come to you too. And whats more, instead of spending months figuring out the right way to make a profit from real world affiliate products, with Real World Affiliate Profits you will learn what you need to know in a matter of hours. If you are clamoring for a system that offers you a chance to make money every single month, then Real World Affiliate Profits is for you. * Use Amazon and Commission Junctions Affiliate Programs Effectively! Find Your Most Profitable Online Business Strategy! Have you ever searched for a new product online and couldnt believe that the prices were so much cheaper than what you found in the stores near your house? If so, you are not alone. Every year more people are doing more of their daily shopping online. This is your chance to profit from this trend. Every major online retailer has an affiliate program and they are all clamoring to find new customers. You can take advantage in this hole in the industry. Only Real World Affiliate Profits can show you exactly how. Dont spend another second on a poorly constructed downloadable affiliate marketing campaign. 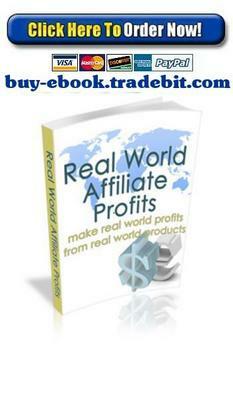 Buy Real World Affiliate Profits today at bargain price $1.99!